Fencing is a sport with a long history. It is one of the oldest sports and has been part of the Olympics since 1896. Fencing is a graceful, fast and tactical combat sport in which the aim is to hit the opponent without taking hits yourself. In some countries in Europe fencing is a very popular sport. In the Netherlands, fencing has become smaller sport. Even so, in 1995 World Fencing Championships came to our country. Our club competes in all three weapons; foil, epee, and sabre. In foil and epee a touch is scored using only the point of the weapon on the target area of the opponent. 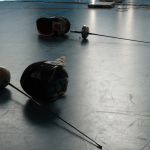 In sabre fencing a hit can be made with the point, the cutting edge, or the forward third of the back edge on the the target surface: the upper body and head. Each weapon has its own rules (see contest rules ).